Obamacare critics keep insisting that Obamacare is a bad deal for most people buying insurance on their own. And a big reason is that they don't think much of the subsidies. I know. You're getting tired of hearing about the subsidies. Bear with me, because today we have some new and important information, thanks to a new study from the Kaiser Family Foundation. Actually, it does change the essential facts—by quite a lot. The study, by Larry Levitt, Gary Claxton and Anthony Damico, shows it. The authors start by figuring out what the initial, upfront cost of insurance will be for people buying coverage on the exchanges. Based on Congressional Budget Office projections, the average across all households—that is, individuals and families, of all ages—works out to $8,250 a year. That’s not a bad price for comprehensive coverage: It’s in the same ballpark as policies that employers provide employees. Still, it’s more than some families buying coverage on their own might pay today, because they have skimpy policies or benefit from preferential pricing for the healthy that Obamacare prohibits. That’s why conservatives insist people won’t want to sign up for Obamacare's insurance options. But, again, those are the initial premiums. 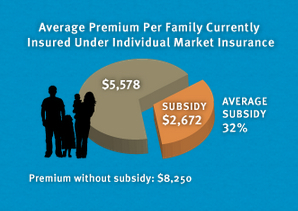 According to the Kaiser study, the subsidies on average will reduce premiums by $2,672, or about a third of the price. The averages mask a lot of variation, with more affluent people getting less assistance and less affluent people getting more assistance. People with incomes of more than four times the poverty line, or about $94,000 for a family of four, get no discount at all. That's one reason why some people really will pay more for their insurance next year. Still, the number of people receiving discounts is a lot larger than even many analysts seem to realize. It turns out that about half the people who buy their own insurance today will be eligible for subsidies. For them, the subsidies will be worth an average of $5,548 per household, effectively discounting the price by two-thirds. The study defines the “typical” plan as the second cheapest silver option. (Silver plans cover about 70 percent of the average person’s expenses.) Keep in mind that people who choose less expensive options, like those that cover fewer expenses, will pay even less for their coverage. "It makes sense to look at what people will pay for health insurance after taking tax credits into account, just like we do for things like 401(k) plans, child care, or educational expenses," Levitt told me. "The law provides a surprising amount of financial relief for people who are buying their own insurance today, not to mention the uninsured, who tend to have lower incomes." Len Nichols, a health economist at George Mason University, agrees. "In many ways, what the ACA is about is extending premium tax breaks to those without good employer offers today, and doing so through a sliding scale that provides the most help to those who need it most." Of course, Lowry and other critics downplaying the subsidies aren’t just making a statistical argument. They’re also making a philosophical claim—that subsidies simply hide the cost of insurance, by transferring it to taxpayers, rather than reduce it. But that’s a separate question, to discuss at another time. For now, we should at least agree on the arithmetic, which the Kaiser Foundation study lays out nicely. A large portion of people who buy individual coverage through Obamacare are going to be eligible for subsidies. And those subsidies are going to be worth, on average, thousands of dollars per person. Update: My initial item mischaracterized the average premium figures, which were for all households and not just families.